The beginning of the new school year is just around the corner and Legacy Community Health, Houston’s largest non-profit community health system, wants to remind parents that now is the time to schedule their children’s sports physicals. The state of Texas requires annual sports physicals (or pre-participation exams) for any student who wants to participate in school sports. The exams can also be a good idea for students participating in some extracurricular activities. “The main purpose of the exam is to rule out the risk of serious injury or death that may have been avoided if not for screening. We work to make sure a child is safely able to participate in sports,” said Dr. Tamisha Jones, medical director of pediatrics at Legacy. Sports physicals are not as comprehensive as a regular physical. No lab work is drawn and issues not related to sports participation are generally not discussed. 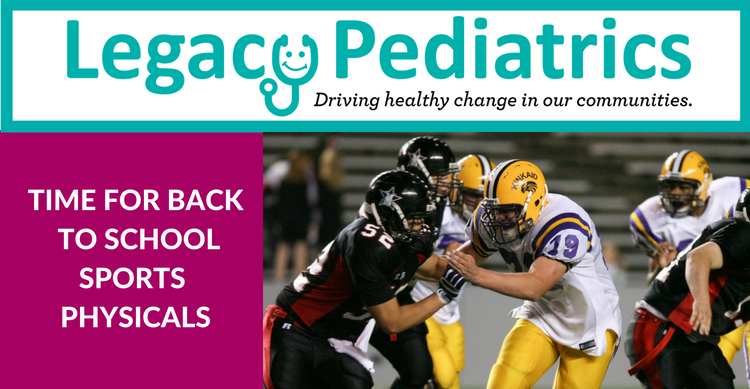 At Legacy, sports physicals are often available the same week they are scheduled. In addition, if parents are scheduling a child’s well visit at Legacy and let staff know that their child also needs a sports physical, both can be done as part of the same visit.